Championship side West Ham have sealed the signing of former Fulham and Portsmouth midfielder Papa Bouba Diop. 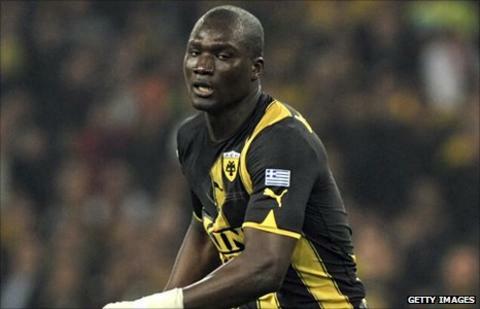 The 33-year-old Senegal international was a free agent after being released by AEK Athens, who he joined in 2010. He has agreed a one-year contract with the Hammers, which includes the option of an additional 12 months. Diop is Sam Allardyce's ninth signing and a timely arrival after Scott Parker's move to Tottenham. "I am very happy, It is good to be here," said the imposing 6ft 5in midfielder. "I want to help West Ham go up and hope we can be successful. "English football is the best in the world. I have come here to work hard and give 100% in every game I play for West Ham. I want to show people I am back again." West Ham have also signed David Bentley on loan from Tottenham for the rest of the season and Arsenal midfielder Henri Lansbury, also on a season-long loan deal.